"This is a great substitution for buffalo wings! Can be made gluten-free, vegan, or vegetarian. Make sure to coat your cookie sheet well with oil or they will stick. Husband and kids give this two thumbs up! Dip this in ranch or blue cheese for even more added flavor, but it doesn't need it." 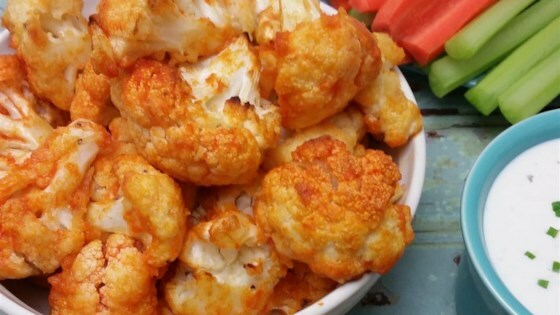 Baked cauliflower florets in a spicy pepper sauce. Gluten-free flour uses less liquid than wheat flour. You may have to adjust the liquid based on the flour you are using. All-purpose flour can be used in place of gluten-free if desired. This came out absolutely scrumptious! For those complaining about crispness I don't know why... cut my florets in half so they lay flat side on the pan and they came out good and crispy!